Wow, that was an amazing weekend on Brick Lane. I received hundreds of apologies on the stall and only had time to post a small number on the insta feed @thesorrystall during the show. I was really pleased that so many people went for the poster option and were planning to give the poster to the eprson to whom they were apologising - that was a key part of the installation as I hoped people would apologise directly to the person they wanted to (if they could) and so many of you also took photos of your anonymous cards before posting them, or bought one of the “I am sorry” cards to pass on. I could not have asked for a better response, the generosity of the visitors was fantastic. I’m going to write up many of the apologies from the show, continue posting them on insta and also write up some more general findings and trends - I’ll add a post here over the next couple of weeks when I have the time. 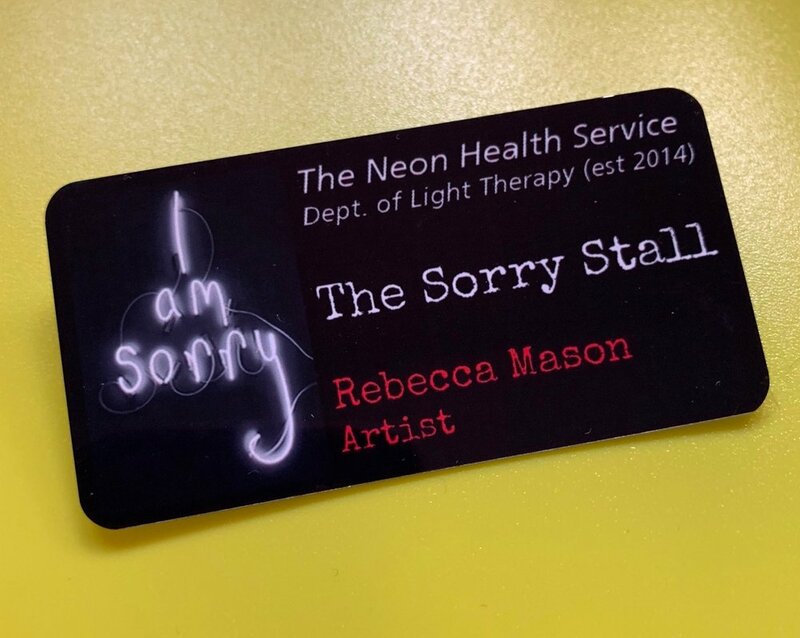 Artist Rebecca Mason returns to TOAF with her Neon Health Service, this time in the form of The Sorry Stall. This is a stand where visitors to the fair can make apologies (anonymously or on an attributed basis) for things they regret. A selection will be displayed on the stand, posted on social media and some of the best (and worst!) will form a new background to Rebecca’s neon artworks. 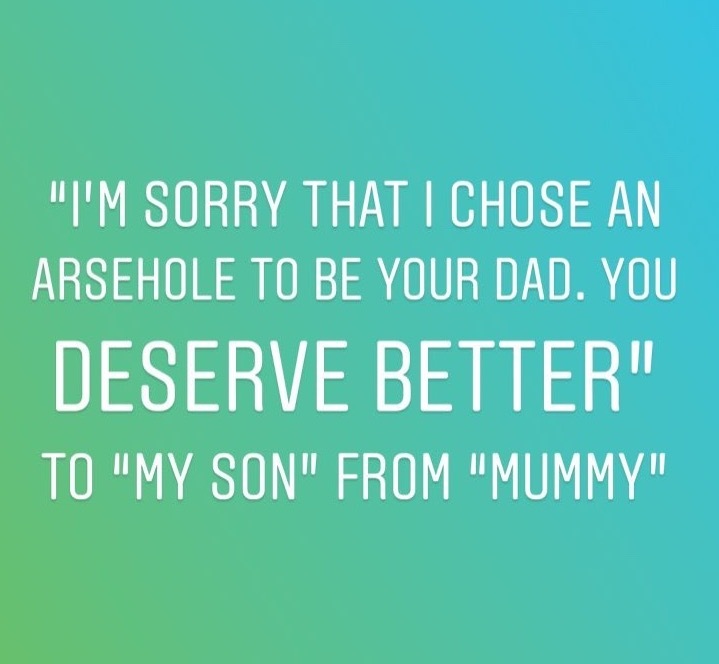 Rebecca has already created an artwork full of her own apologies, and this will be displayed on the stand in an attempt to encourage participants to disclose their own. We’d also encourage everyone to share their apologies with the person to whom they are directed (if they can) to make it count as much as possible. Participation is free, though there are also options available on the stand to purchase limited edition cards and posters to take away in the event visitors wish to apologise to someone on a wholly private basis. There are also free limited edition posters being given away. We live in a time where there is said to be “an epidemic of infallibility”. The desire to always look good and to be right often trumps the desire to do "the right thing”. This is amplified via social media, where our daily comments and errors are there for many to see, share and judge. We fear looking weak. Disagreements fester and spiral. But we are all wrong sometimes. We all contribute to the complex scenarios and problems we live amongst today, but in our highly competitive culture, the increasing fear of public shame, plus rising tendency for litigation, can make it even harder to say we are sorry when we know we have made mistakes which have hurt others. Few things are more powerful than having the strength, wisdom, generosity and kindness to take responsibility and admit to yourself and others that you’ve made a mistake. A genuine apology can have the power to heal and resolve conflict. It can restore trust, harmony, dignity and can truly empower others and yourself. This is not an exercise in apologising just “to keep the peace” in situations where you did not do, or do not believe you did, anything wrong. It’s not about apologising where you genuinely believe you don’t need to. It’s not about apologies for the sake of PR, manipulation or those followed with excuses. Nor is it about expecting a particular outcome as a result. It’s about those situations where you believe you have done wrong and genuinely want to apologise and try to remedy the damage done. This is a small section of the whole map - the fair is over a much larger area but this shows you where we are - stand 74, near The Purr Room and the toilets. W H A T A R E W E D O I N G W I T H T H E A P O L O G I E S ? H O W C A N Y O U P A R T I C I P A T E ? Fill in an apology card (behind the screen, or take it away and drop it off later) and post it in the black box. We will take out and display a selection every few hours. - Write your apology on the back of an A3 ltd edition “I am sorry” poster. - We will take a photo of you holding your apology poster. - You can then keep the poster for ***FREE***. - We will keep the photo and may use it on social media, the stand etc. - We’d encourage you to give the poster to the person to whom you’re apologising. We’re also selling limited edition Unfinished Business Cards (£6) and “I am sorry” poster prints (£15) if you’d prefer to keep everything private between you and the person you’re apologising to. Use code RMASON once you’ve selected your options. •	pinning a selection of the anonymously filled-in cards around the stand for other visitors to read (they may also photograph them - we can’t stop this happening given the number of visitors to the fair). •	hanging up, on the stand, a selection the photos we have taken of those who are willing to be photographed with their apology (being photographed is completely optional). •	Instagraming a selection of the handwritten anonymous card contents (again, we will be typing them out then posting a photo of the typed text, again to not give away handwriting etc) via our @thesorrystall account. •	tweeting and instagraming selected photos of guests with their attributed apology (i.e. those guests who were ok to be identified in a photo). •	using a selection of the apologies (but not with any personal details about the person who provided it or to whom it is intended) on the final text background of the planned “i am sorry” neon piece which will likely be released later in 2019. Any visitor participating in the stand by providing an apology is assumed to do so in full acceptance of the terms and conditions overleaf which will also be displayed on the stand. •	Participants must ensure that their apologies are not in any way libellous or otherwise defamatory or discriminatory on any person. By filling in an apology card and posting it into our Apology Box, visitors give us (Rebecca Mason The Sorry Stall) the right to use these apologies in the ways outlined above in (a). •	By filling in an apology poster and agreeing to be photographed holding that poster with apology, visitors give us (Rebecca Mason/The Sorry Stall) the right to use these photos and the apologies contained within in the ways outlined above in (a). •	The photographs will be taken with camera phones and will be sent to our on site printer. Once The Other Art Fair is over, and once we have a print record of each of these photographs (to enable us to have a record of them for consideration into the final “I Am Sorry” neon background), we will delete the original photographs from the camera phones being used on site. They will, however, remain on social media channels, photos taken of the stand etc and we cannot control their redistribution. Rebecca Mason will be the copyright owner of all photos taken by Rebecca Mason/The Sorry Stall for this event. Rebecca Mason/The Sorry Stall takes no responsibility for any loss or claim in the event the phone used is lost or stolen along with the photos, or subject to a cyber attack, prior to the photos being deleted. •	Where apologies have been made anonymously, we (Rebecca Mason/The Sorry Stall) will endeavour to maintain this anonymity via the methods noted above (typing out any shared on social media so that handwriting is not evident). •	HOWEVER, the completed cards that we pin up on our stand during the fair will obviously include the visitor’s handwriting. We cannot take any responsibility for any photographs or visual records of these cards (and any consequences arising from those photographs/visual records) which may be created and/or distributed by other visitors to the fair, or photographers employed by The Other Art Fair/Saatchi Art (and then re-shared by others) given that photography is permitted in the public space and we cannot police this. •	We cannot guarantee that all apologies provided will be displayed on the stand/via social media - a selection will be displayed and shared depending on space and time available as well as content. •	We cannot guarantee that all apologies will be added to the background of the final neon piece produced by Rebecca later in the year. Rebecca will choose, entirely at her discretion, a selection of the apologies submitted as well as including some of her own. •	Rebecca does not guarantee to produce the final neon piece in 2019 - there may be delays which mean it is not finished until 2020 or later. 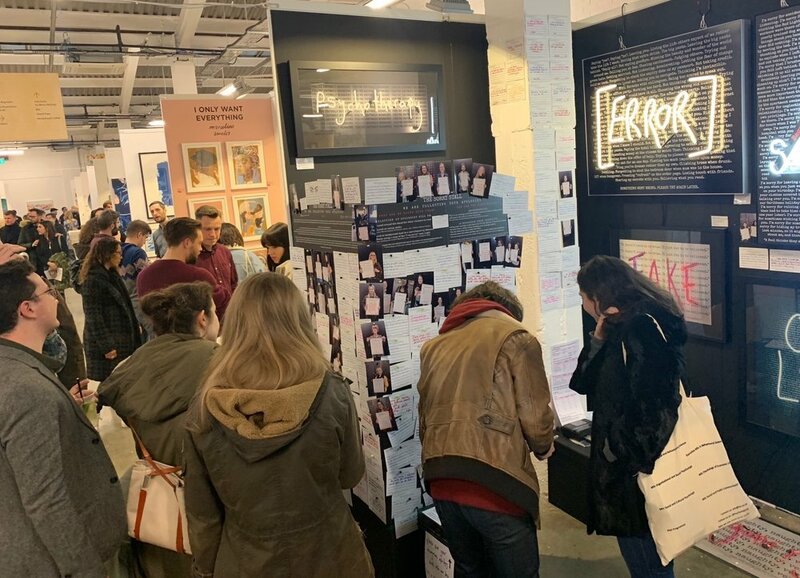 •	There will be no payment or payment in kind made to anyone whose apology is used on the final background artwork to the “I am sorry” neon light or displayed on the stand, shared via social media, contained within visitor or photographer images etc. The final I am sorry neon light artwork (the title of which may also change but which, for now, is referred to as “I am sorry” or “the i am sorry” neon or piece) may be shown at any point in the future at other art fairs, galleries and events. Rebecca Mason will be the owner of the copyright to the piece(s) and any derivatives (limited edition prints, cards etc) and is not required to remunerate, in any way, anyone who has supplied an apology. •	In the event an apology is provided which indicates serious, material and/or illegal harm to another person, living creature and or to significant property, Rebecca Mason reserves the right to escalate as may be required. •	Both the apology cards and the apology posters used at The Sorry Stall/the stand allow (if they wish) the visitor to insert their name and the name of the person to whom it is directed. This is entirely optional (as noted on the cards and posters) and we would advise that if using names please use first names only. This is the case also for the name of the person to whom the apology is directed. Rebecca Mason/The Sorry Stall accept no responsibility if the person receiving the apology is fully identified and if there is any issue or claim arising from that, though all cards will be reviewed prior to displaying on the stand/typing out contents for social media and Rebecca will not use any she considers to be obviously problematic to the person to whom the apology is directed. •	Rebecca Mason/The Sorry Stall accepts no responsibility for any matters arising for visitors as a consequence of them having made an apology anonymously or on an attributed (apologiser identified) basis. This may include, but is not limited to, the consequences of sharing and re-sharing on social media, disagreements with the person to whom the apology was directed or claims and/or legal action made by the person(s) or representatives of the person(s) to whom the apology was directed. I need someone to assist me with staffing a feature at The Other Art Fair (BRICK LANE, LONDON) in March. In short, you'll have to help me with audience participation on the stand I am doing - explaining how it works (I'll obviously reveal more to applicants! ), some tech related work possibly (downloading something from an app, putting it into iTunes), taking photos and printing them out as well as keeping your eye on the stand. I'll be there the whole time too but it will be too much for me to do alone during busy periods. It’s nothing complicated - just encouraging people to fill in things, some to be photographed etc, doing a bit of social media posting also. I am not paid for this (thought obvs if i make sales and cover all costs i get paid!) but am paying £8ph for this role. The person must be really reliable (I am counting on you to help me with this), turn up on time, you'll be dealing with members of the public all the time so must be friendly, approachable etc. No sales work involved, purely visitor experience stuff. Might have to fetch me (and you!) drinks/chips now and then. Hopefully this will be good experience for you to work at an Other Art Fair/Saatchi Art stand for a few days. You'll be paid at the end of the whole show (the Sunday night - no delays etc! ), I'll give you free PV and weekend tickets for a couple of friends etc and if you do really well there might be an extra something by way of appreciation - of course, it goes without saying that if you do a good job I am more than happy to provide references for you also. Please send CVs and a little bit of info about you/why you're up for this to INFO@ROCOCOWONDERLAND.COM by 6pm Sunday 17 Feb 2019.